The Norman RST-101 (812549) Posing Stool includes a rotating 14" padded vinyl seat with a height adjustment that can be varied from 20" to 30". A cushioned pneumatic column prevents a sudden drop. The PT100 (812360) Posing Table has an adjustable height that ranges from 27" to 43" to accommodate sitting and standing poses. 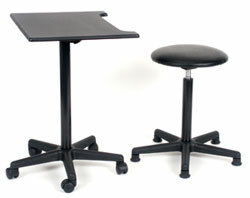 It includes an air cushioned column that prevents sudden drops, and a 5 leg base with casters for easy placement.